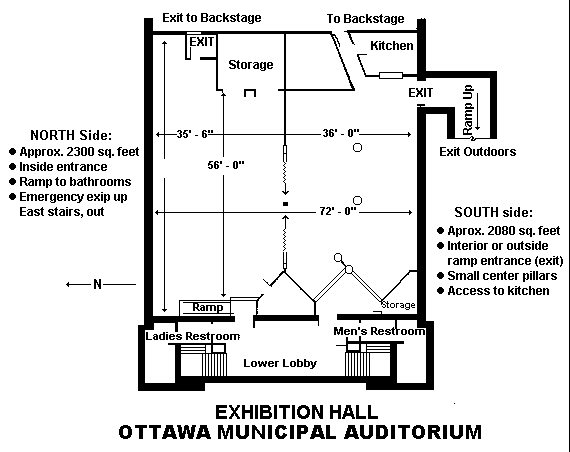 The Ottawa Memorial Auditorium is available to rent for: live performances, meetings, weddings, family dinners, showers, banquets and more. There are three main areas for rental usage: The Main Hall, Mezzanine Meeting Room, and Basement. The auditorium seats 820, the occupancy for the mezzanine is 110 and the basement occupancy is 243 and does include a full kitchen. Tables and chairs are supplied in the basement. Mezzanine rentals begin at $10 per hour, basement rentals begin at $20 per hour. Please contact the Ottawa Memorial Auditorium Director to discuss rates for your event or performance. The Ottawa Memorial audio system and light board shall be ran by an OMA employee or an experienced technician approved by the OMA Director. Dressing rooms are available for performances and weddings. Screen and projector available by request in the main hall and in the mezzanine meeting room. Schedule a tour of the OMA by calling 785-242-8810. * All rentals require a deposit due with the signed contract, unless specifically waived by OMA management. This deposit is in addition to the rental fee and will be returned upon completion of the rental contract, less any additional charges or cost that apply. Any and all charges can be waived by OMA management when deemed appropriate. * All commercial rentals require an appropriate insurance certificate, unless the event is sponsored by OMA or specifically waived by OMA management. * Unexpected facility usage before or after contracted hours may be allowed by OMA management (maximum of 2 hours). Extra pro-rated, hourly fees apply. * An additional fee may be charged for extraordinary technical/electrical usage or physical set-up/clean-up, as determined by OMA management. * An appropriate OMA employee will be on duty during all rental periods, unless deemed unnecessary by OMA management. * When there is a need for additional staffing, OMA management has the authority to determine which staffers are required.